Lachlan Millar, Shadow Minister for Fire, Emergency Services and Volunteers, MP Pat Weir, Member for Condamine, Tony Perrett Shadow Minister for Agricultural Industry Development and Fisheries and Forestry, and Steve Bennett, Shadow Minister for Child Safety, Youth and the Prevention of Domestic and Family Violence, Shadow Minister for Veterans visited several clubs on the coast, including with Rainbow Beach Commerce and tourism members at Arcobaleno on the Beach. Rainbow Beach Commerce and Tourism welcome back President Mark Beech, Secretary Tony Stewart, new treasurer Nigel Worthington, and committee members Heatley Gilmore and Brooke Bignall (Assistant Secretary). Local MP Tony Perrett and his fellow cabinet members advised RBCT members that there was 3.92 billion dollars in interest only debt owed by the State Government. The debt is accumulating at $420,000 per hour and $7,000 per minute. He said that NSW had no debt and their infrastructure is twice that of Queensland’s, compared to our 80-billion-dollar state debt. At the RBCT general meeting it was resolved to send a representative to the Teewah Beach Working Party at the next meeting on 3.30pm, Monday November 5 at Noosa Council office, Tewantin. 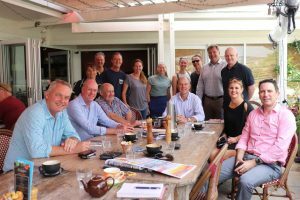 The group also discussed tree lighting, new play equipment at Phil Rogers Park and Our Towns progress, Bruce Highway progress,Coondoo Bridge, ArtyBall, Festival of Small Halls Concert and Who’s New at the Zoo 2, and the Welcome Dinner. If you would like to be a member, please contact Mark on 5486 3211. Hi, just making a suggestion as we travel from Victoria to Rainbow Beach then on to Fraser island. Every time we visit to stock up and purchase meals, and buy other items supporting Rainbow Beach businesses, we find that most of the drive-through parks for cars and caravans/trailers/campers are taken by single vehicles, with heaps of other parks available. It would be a great idea to put signage up to notify single vehicles to park elsewhere. Editor: We agree. This has been communicated to Council, and hopefully they can include this and more in their RV strategy which will soon be available for public comment. We’ve had some busy days over the holidays, and weekends – inevitably visitors do park on the verges! Just a suggestion for busy days, as more are coming – if local business owners and team members parked out of the immediate town area (past the caravan park entrance, in Rainbow Beach Road, or on the Esplanade) – or even walked or cycled to work (!) – it would free up more parks for customers. What do you think? We think that the Dolphin Centre is rather special for our visitors and to confirm this I give you a comment from our Visitors Book. “As a tourist from Perth, W.A. I would like to congratulate your whole team on your fantastic management of our precious dolphins – it was wonderful to see so many people given an opportunity to view the dolphins close up. The ongoing commentary provided great relevant information, the public were kept informed, they were educated about the special place we have here. Lovely manner/manners, gently watchful, mindful, clear instructions and demonstrations of expectations. Explanations – clear, concise – fabulous, impressive teamwork by Volunteers, exceptional management. It is on 12pm to 2pm, November 22, in Gympie (venue to be advised). For more information or to (be an early bird) and reserve your place, contact economicdevelopment@gympie.qld.gov.au or call 1300 307 800. The Pub is making a comeback!